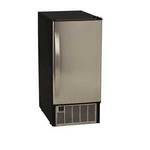 Are you thinking about buying an undercounter ice machine? An undercounter or built-in ice maker is a great choice when you need to make a lot of ice, continuously without wasting your counter space. An under counter ice machine also hides nicely inside any decor - just like a cooking range or dishwasher. When shopping for an under counter ice maker, you need to consider several important factors and features that we will cover in this 10-minute buyer's guide. But first, let’s take a quick look at the 8 best under-counter ice machines you can buy online right now (in my humble opinion). A major limitation with most ice makers is that they cannot store ice cubes for long. If you leave them in for too long, they begin to melt. This is because most units don't have a freezer function. The Sunpentown IM-150US is different. In addition to making ice, it can also store it for however long you want. The storage bin is located within a built-in freezer. This is the main reason we selected it as the best undercounter ice maker for kitchens. Most families don’t need to use all the ice at once. Being able to store it for long comes in handy. You don’t have to make new ice cubes every time you need some, and there’s no need to use precious refrigerator space to store the ice cubes. The Sunpentown IM-150US produces up to 12lbs of crescent-shaped ice cubes every 24 hours. The storage bin can only hold half that amount at a time. When the ice bin fills up, the machine will automatically stop making more ice. You can use the Sunpentown IM-150US as a built-in or freestanding ice maker. The front ventilation ensures the machine functions normally if you decide to install it under your counter. Take note of its dimensions (15W x 18D x 25H inches) to make sure it will fit undercounter or wherever else you plan to install it. The ice maker’s stainless steel door blends in well with your cabinetry. The door is reversible so you can position it how you want based on your kitchen design and personal preferences. Installation is a bit of a hassle. The manufacturer highly recommends calling a licensed plumber. But even with a pro doing the installation, most customers still experienced a few hitches. It takes some work to get the ice maker working properly. 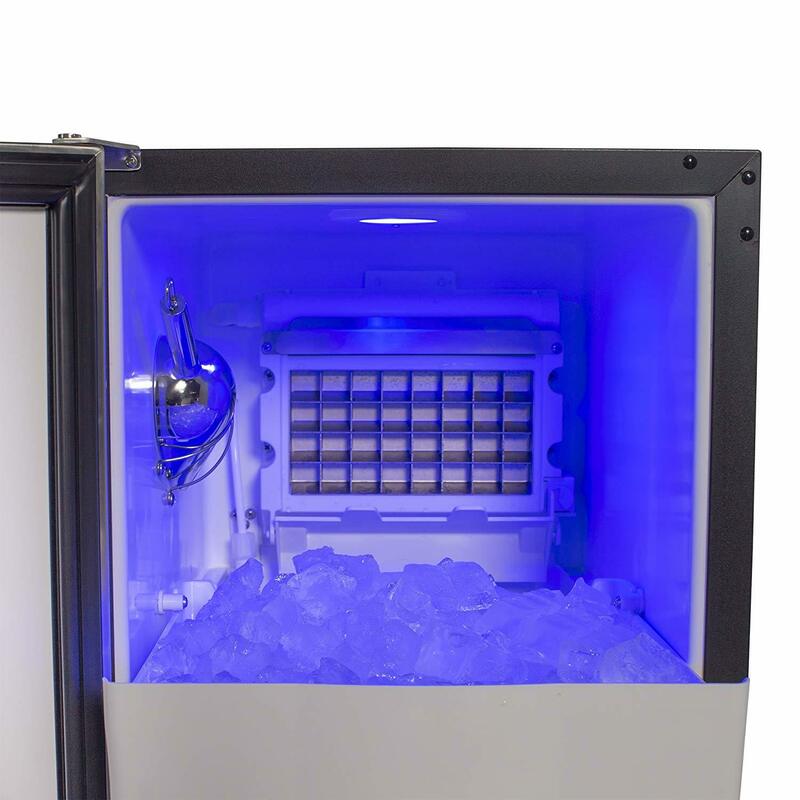 The Scotsman CU50GA-1A is our top pick for home bars because it produces clear gourmet ice cubes. This type of ice not only looks more elegant in your favorite drink, but it’s also melts slower. It has a front exhaust so you can easily install it undercounter. You can also use it as a freestanding ice maker. The Scotsman CU50GA-1A is big both regarding physical size and production capacity. It can produce up to 65lbs of ice, enough to serve an entire bar. 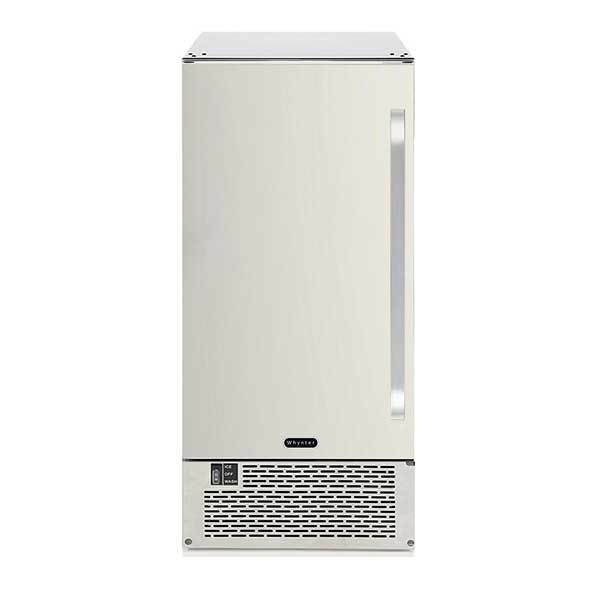 In fact, this ice machine was designed for commercial applications. But it’s just as perfect for your home bar. If you love inviting guests over often or holding parties at home, this ice maker is great. It can store 26lbs of ice and will automatically stop making more ice until you empty the bin. The Scotsman CU50GA-1A produces clear and hard gourmet ice cubes. It’s the same kind of ice you’d find at a high-end restaurant or bar. Because it melts very slowly, it’s ideal for cocktails, premium wines, and spirits. Each cube measures roughly 1" x 1.13" x 1.25". An integrated sensor continually monitors the quality of water coming in. If it senses hard water, the machine automatically flushes away the minerals after every ice making cycle. This prevents the buildup of scale which can lower the quality of ice and reduce the machine’s lifespan. The machine can get a bit noisy especially when the ice cubes, which are quite large, are falling into the bin. 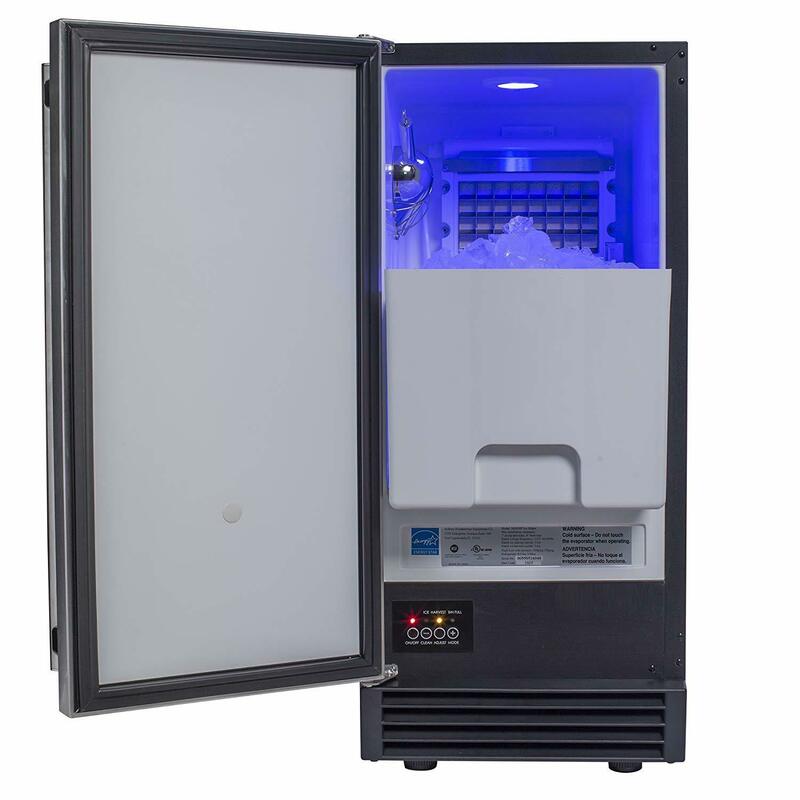 With a 50lb ice production capacity, the SPT IM-600US undercounter ice maker is big enough for small and mid-size offices. The reversible stainless steel door and front exhaust makes installation easier and ensures it blends in well. 50lbs is plenty enough ice to keep everyone drinks in the office chilled. The bin stores up to 25lbs of ice at a time. So you can leave the machine making ice overnight, and you’ll find the bin full in the morning. If you want to start on another batch immediately, empty the ice cubes and store them in a freezer. The ice maker won’t work if the bin is full. The SPT IM-600US produces crystal clear gourmet ice cubes that melt slowly and don’t dilute drinks. The stainless steel door can be reversed to open from the opposite side. This makes it easy to install the ice maker fit the available space. Regarding style, the stainless steel finish looks great and blends well with other cabinetry. The ice comes out as a sheet instead of cubes. You have to break them up. If you buy this ice maker, also buy a stainless steel scoop to break the ice. The plastic one that is included is practically useless. Drainage: Required. Drain hose included. It’s true that most undercounter ice machines are expensive. 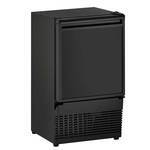 The best ones cost no less than $600 with some such as the 65-lbs Scotsman gourmet ice maker going over $1,000. But you don’t have to resort to portable ice makers you are on a budget. The EdgeStar IB120SS is great undercounter ice maker that costs just $300. It doesn’t produce as much ice as other undercounter ice machines, but it produces enough for most families. Unlike many pricey ice machines, this one has an integrated freezer. So you can store your ice as long as you want. The EdgeStar IB120SS can produce 12lbs of ice per day. This is enough for most homes where ice is needed just once a day and during weekends. It’s also adequate if you love hosting friends. The storage bin can hold up to 6lbs of ice. Once it gets full, it stops making ice until it is emptied. The storage bin doubles up as an integrated freezer. Unlike most ice makers where you can’t leave the ice cubes inside for long lest they melt, you can store your ice cubes in this ice maker for however long you need. The EdgeStar IB120SS has a front-vented design. This means you can safely use it as a built-in ice maker. You can also leave it freestanding. The black cabinet and stainless steel door combo look very stylish and modern. The Whynter UIM-502SS ice maker produces 50lbs of ice a day. That’s similar to the amount of ice produced by many restaurants and bar commercial ice makers. The ice is clear and hard. It’s not the quick-melting cloudy kind your freezer makes. This is one of the best commercial-capacity ice makers. With 50lbs of ice production per day, it's more than enough for most homes. It’s especially handy if you love hosting home events and parties.You can also set it up in an office. The storage bin can carry up to 25lbs of ice. The ice maker automatically switches off when the bin is full. The Whynter UIM-502SS produces clear ice cubes; the same type served in bars and restaurants. The ice cubes are harder than traditional cubes hence melt slower and don’t dilute your drinks. 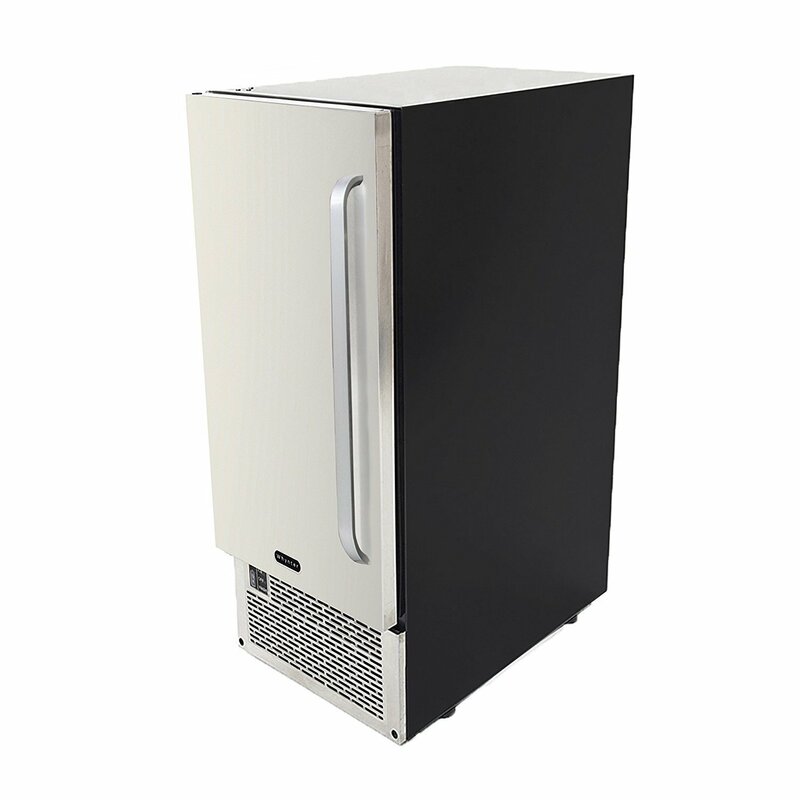 The ice maker comes with a stylish stainless steel door and a black cabinet. You can just leave it freestanding in your kitchen, and it’ll still look good. The door is reversible allowing you to install it based on the available space. It's quite noisy. One customer says it sounds like a running dishwasher. This Energy-Star Approved undercounter ice maker is great for those who want a lot of clear ice cubes. Because it needs a line-in and gravity drain, professional installation is highly recommended. The Orien FS-55IM produces clear gourmet ice cubes measuring around ¾” x ¾.” To ensure the best quality ice cubes, the manufacturer recommends using an inline water filter. The ice cubes are ideal for cocktails, spirits and premium liquor. They melt slowly and look more elegant. 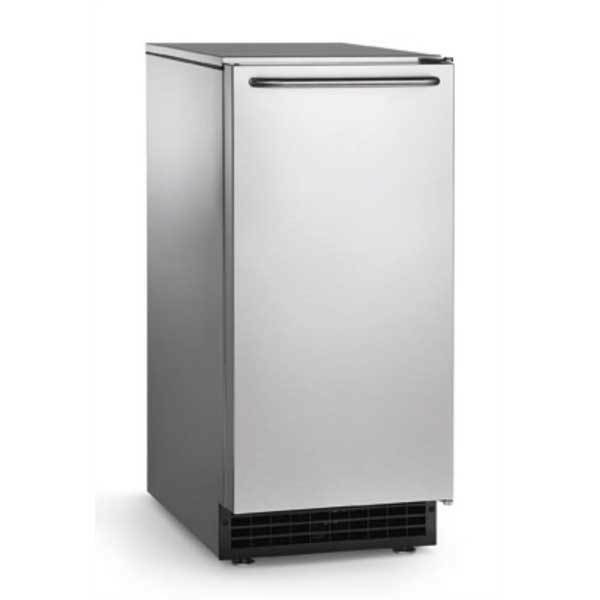 The ice maker can produce up to 44lbs of ice per day. The removable storage bin can hold 25lbs of ice. When it fills up, the inbuilt overflow protection switches off the unit until you empty the bin or the ice cubes melt. Depending on your space and personal preferences, you can reverse the opening orientation of the stainless steel door. As is the case with many large ice makers, this one tends to make a bit of noise especially if it is freestanding. Most of the noise comes from ice cubes falling into the storage bin. 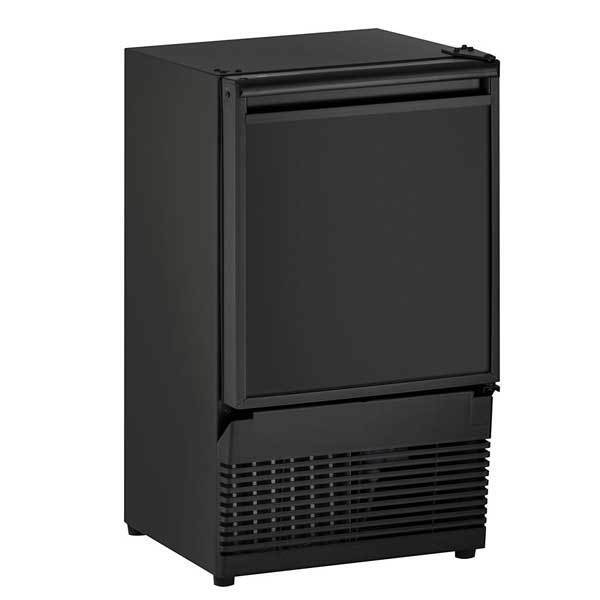 This all-black undercounter ice maker looks stylish, but it’ll cost you quite a bit; around $1,100 to be specific.The price tag is especially surprising considering that it produces less ice than most undercounter units. But most customers say it’s one of the best units they have ever owned. It is super quiet, makes ice fast and is easy to use. It also has an integrated freezer function. The ice maker produces around 23 lbs of ice per day. This is plenty enough for most homes even with guests over. The storage bin holds up to 12 lbs of ice. As long as the unit is plugged in, your ice cubes will stay solid. The storage bin also functions as a mini-freezer. So you can leave your ice in there as long as you want without worrying about it melting. You can reverse the door’s opening orientation. If you want a more customized look that blends in perfectly with your kitchen, the U-Line BI95B-00 ice maker accepts custom panels. See the manual for installation instructions. For its price, it’s disappointing that this ice maker does not make gourmet ice cubes. 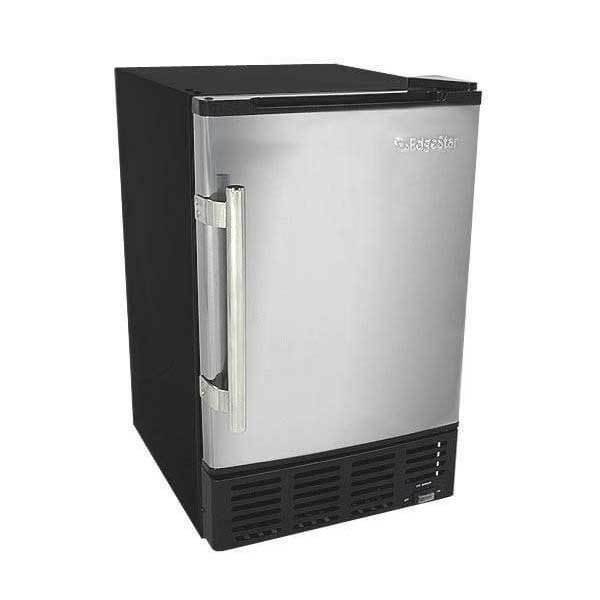 This is a cheaper alternative to the Scotsman CU50GA-1Agourmet ice maker. It produces clear ice and even though it has less production capacity, 45lbs of ice a day is still a lot and more than enough for most homes. The EdgeStar IB450SS can make up to 45lbs of ice every day. At full capacity, it can easily serve a bar or restaurant. At home, it’s perfect for large families and those who love hosting often. It’s also ideal for offices. The removable bin can store 25lbs of ice cubes. Note that this ice maker has no freezer function. As soon as your ice cubes are ready, take them out and store them in your freezer. Otherwise, they’ll start melting after a couple of hours. 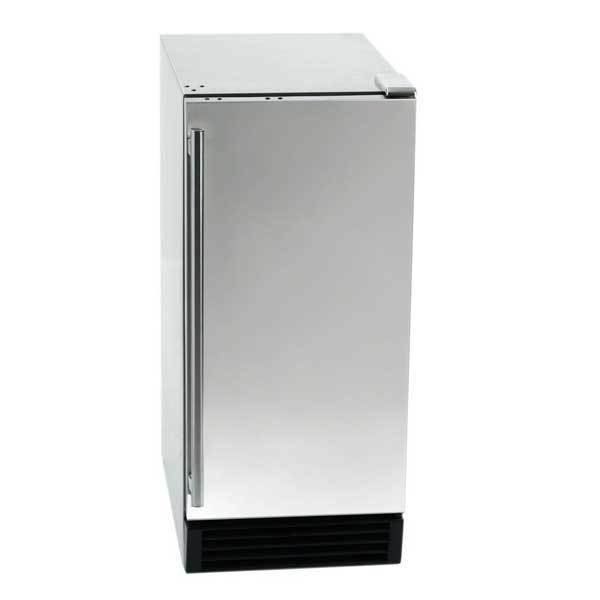 The ice maker comes with a commercial-grade stainless steel door. You can reverse it depending on your installation needs. The legs are also adjustable. The EdgeStar IB450SS produces restaurant-quality ice cubes. They look elegant and melt much more slowly than traditional ice. The main complaint from customers is that the ice maker produces sheets of ice that are hard to break. Some users have found a button in the back panel to adjust the sheet thickness and make it easier to break it into cubes. Unfortunately, the manual doesn’t mention anything about this. 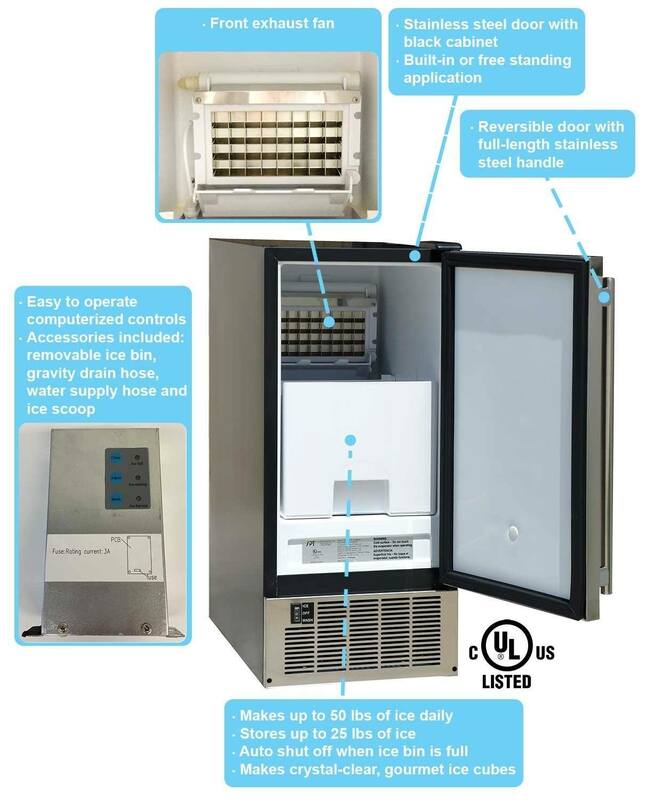 The Chef’s Exclusive undercounter ice maker produces a respectable 60 lbs of ice per day. That’s not as much as the Scotsman Prodigy, but it’s still more than enough for most homes. You can even use it in a bar, restaurant or venue. What you’ll love most about this ice maker is the versatility it provides especially in terms of installation. Whatever your kitchen or home bar situation, installation won’t be a problem as long as you have enough under counter space. Here are the dimensions you need to note before buying this ice maker. 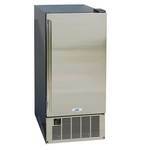 But even if you don’t have a space to install it undercounter, you can still use it as a freestanding ice machine. 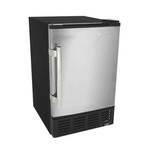 This clear ice maker produces up to 60bs of ice per day, enough for most family’s needs and even commercial establishments like bars and restaurants. 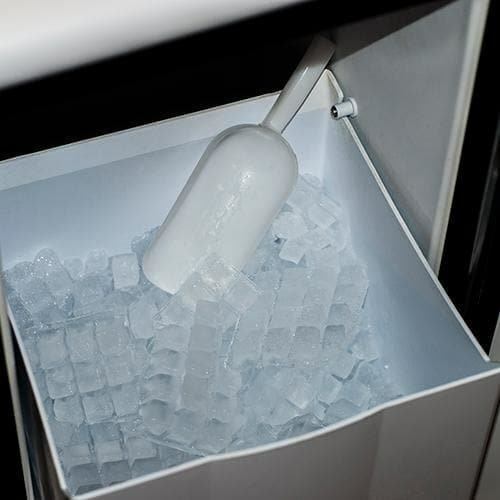 The gourmet ice cubes are stored in the ice bin which holds a maximum of 25lbs of ice when full. The ice maker automatically shuts off when the bin fills up, so you don’t have to worry about any messes. As soon as you empty the bin, it will resume making more ice. Note: The ice bin is not refrigerated. Do not leave the ice there for too long as it will melt. If you are not planning to use all the ice at once, store it in the freezer. You have various options when it comes to installation. For one, you can set the door to open from either the right or the left. This is great for both right and left-handed individuals. It also allows you to install the ice maker wherever you want without worrying that something will obstruct the door. You also get two drainage options. There’s the normal gravity drain where you connect a drain hose from the plug to a floor drain. If your drain is higher than the plug, you can use the included drain pump to force the water upwards. This saves you the trouble of hunting down a compatible drain pump. A blue LED light conveniently illuminates the interior when you open the door. This is especially handy at night. 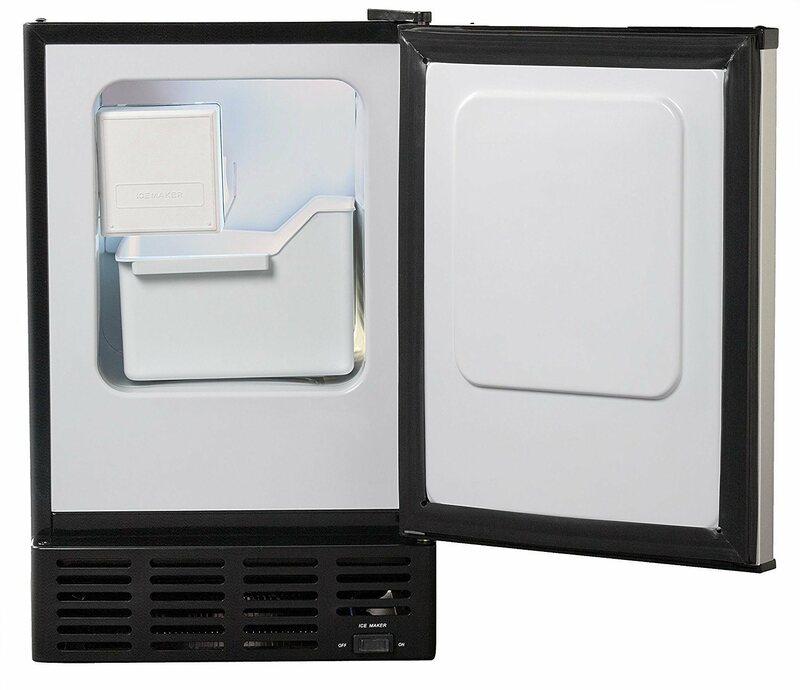 Once you install the Chef’s Exclusive ice maker, it’s very easy to operate. The control panel has all the buttons you need and indicators to tell you what’s happening (e.g., ice bin full). 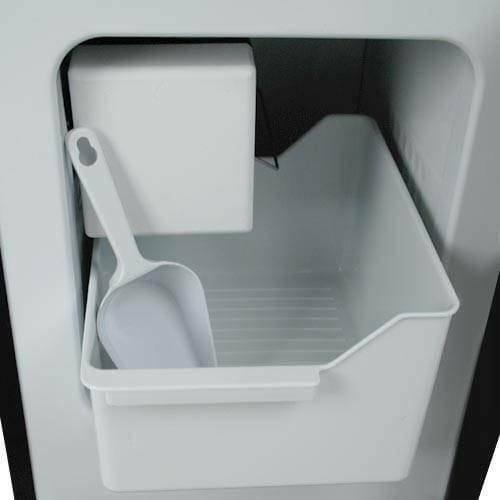 The ice machine comes with a stainless steel scoop and a holder for it inside the bin area. The bin itself slides out easily for those times when you want to dump all the ice into another container. • High production and storage capacity – enough for large families and commercial establishments. • Premium quality gourmet ice cubes. • Requires more time and effort to set up compared to small portable ice makers. There are different types of drink ice. The best one for you depends on your needs. If you want the ice for your cocktails whiskey, look for a unit that makes clear ice. If you want soft chewable ice, get a unit that makes nugget ice. Also check the size of the ice cubes, how fast they melt in drinks and their shape. The ice making capacity, also called the production capacity, is the amount of ice a unit can make in a 24hr period. The right figure will depend on your needs. 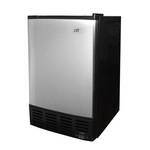 If you need a lot of ice through the day, we recommend a 40lb+ ice maker. If the ice machine serves just 1 or 2 people, even a budget 12lbs undercounter ice maker will do. The next important figure to look for after production capacity is storage capacity. This is the maximum amount of ice a unit’s storage bin can hold. It’s often half the production capacity. For instance, an undercounter ice maker with 45lbs production capacity will have a 25lb storage capacity. The more ice you need, the higher the storage capacity should be. Another feature of the storage bin to consider is whether it is insulated or refrigerated. Most models have insulated bins meaning stored ice will melt after some time. Such ice makers often require a drain connection to get rid of melted water. Other models have a refrigerated storage bin. Your ice cubes will stay solid even if you leave them there for days. These models often don’t need a drainage connection. We recommended a refrigerated ice maker. Surprisingly, refrigerated models are not always the most expensive. If anything, most $1,000+ under counter ice machines have insulated rather than refrigerated bins. 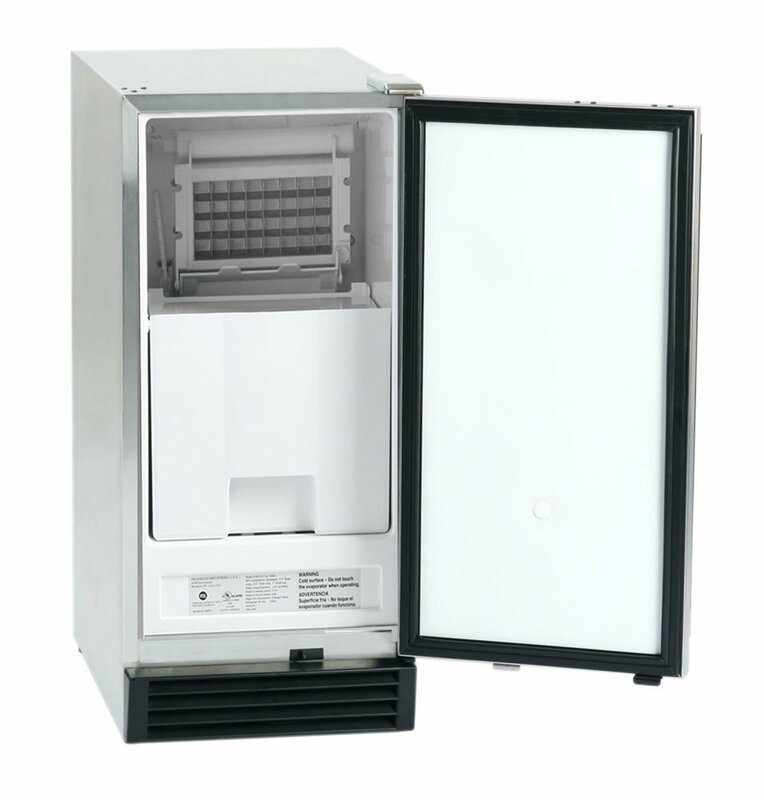 You are more likely to find an ice maker with a freezer in less expensive models. There are three kinds of situations possible when talking about ice machine drainage: no drainage, gravity drainage or pump drainage. Of course, no drainage ice machines are the most convenient and easiest to install. 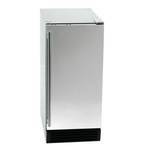 Refrigerated ice makers usually don’t need any drainage. Gravity drainage ice makers require a hose to be connected to the unit from where waste or melted water can flow out through gravity. If your sink or kitchen drain is not accessible via gravity, you’ll need a model that can work with a pump drain. A pump drain can drain the melted water into a sink or drain located higher than the unit. Compressors in ice makers can be cooled by either air or water. Almost all modern ice machines use air-cooled compressors. Vents and fans circulate air from the room inside the unit to cool the compressor down. The hot air is vented out, and cooler air is taken in to continue the cooling process. Air-cooled units use more energy and can increase air conditioning costs (because of the hot air released).But they don’t need any extra water other than the one used for making ice. A water-cooled unit uses water to cool the system. The hot ‘used’ water is taken out through the drain. Water-cooled units use much less electricity but need a lot of water to function. That’s why they are being pushed out of the market. 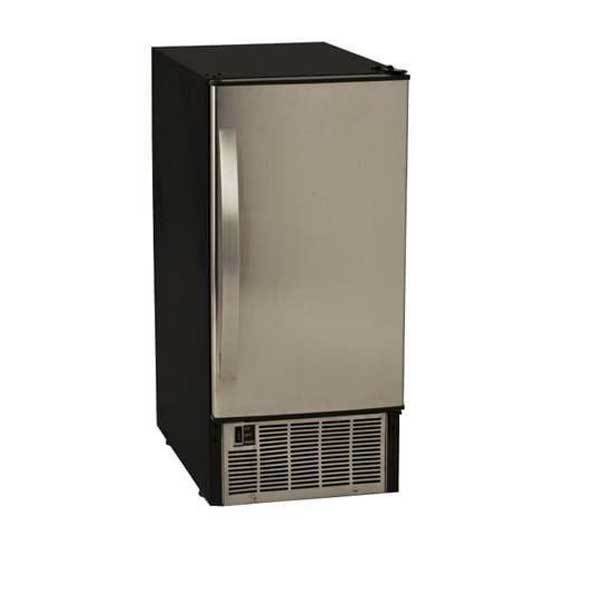 When shopping for an undercounter ice machine, buy an air-cooled one. You don’t have much choice here since all undercounter ice machines require a line-in. You don’t add water to a reservoir like in smaller ice makers. Note that most many manufacturers recommend installing an inline water filter to maintain ice quality and protect the ice maker. Only one unit above, the Scotsman CU50GA-1A, has a water quality sensor that detects hard water and automatically clears mineral buildup. Look for a unit that is easy to clean and maintain. Some units have a CLEAN button. When you press it, it automatically runs water through the unit and drains it. For most undercounter units, however, it’s always a good idea to call a professional if something is wrong. They have complex systems and numerous components that you can easily damage when trying to repair. Check whether the unit has a reversible door. 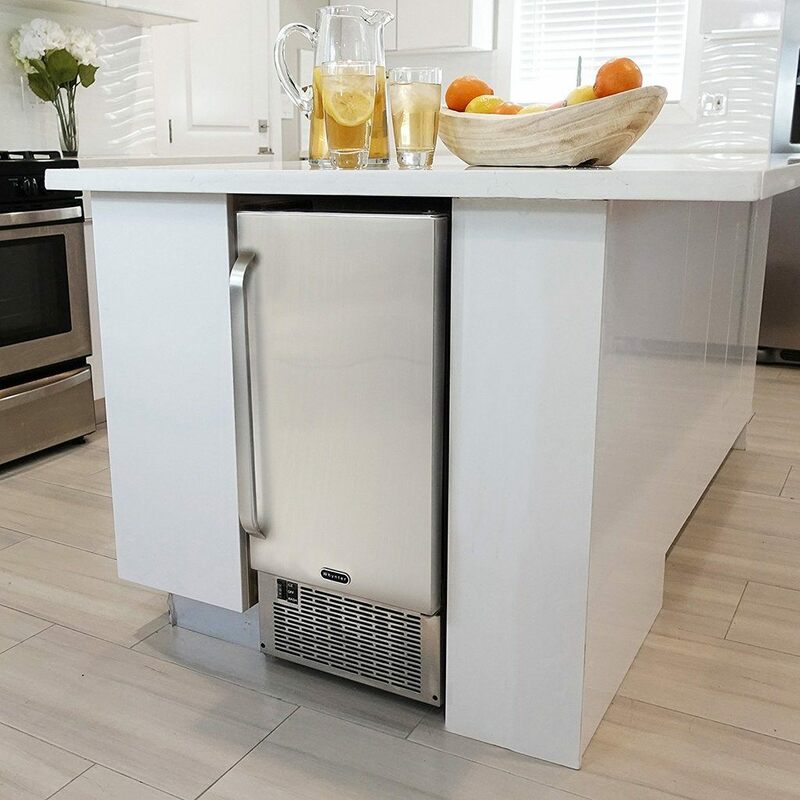 This is important as it gives you the freedom to install the ice maker where you want without any walls or cabinetry hindering the door from opening properly. On the same note, check whether you can use a custom panel. It allows you to customize the style of your ice machine. Finally, read customer reviews to find out how noisy the unit is. While all units will produce some noise, others won’t give you any peace when they are running. Avoid them. The premise of all ice machines, whether portable, freestanding or undercounter, is that they turn water into ice. The actual process is much more involved and requires several parts to pull off. At the heart of an ice machine is a compressor. The compressor pushes a refrigerant (in the form of a gas) through a series of tubes collectively called a condenser. In the condenser, the refrigerant is cooled by either water or air. That’s what the terms water and air-cooled ice makers refer to. If it is a water cooled machine, the cooling water is taken out through the drain. If it is an air cooled ice machine, the warm air is exhausted from vents either at the back or the front. The liquid moves on to a part called the evaporator. Here, it absorbs heat from the environment and turns back into a gas. There is water constantly pouring over the evaporator. It gradually cools down as it loses heat and turns into ice. The ice forms as several cubes connected to a sheet. It is pushed out by a piston or by heating the surface below them. As they fall into the bin, they break up into individual cubes (but not always – sometimes you have to do the breaking yourself). The evaporator can be designed to produce ice in various shapes such as full cubes, half cubes, bullets or pebbles. In nugget ice makers, the final process is a bit different. The evaporator is in the form of a cylinder and water freezes on the inside walls. An auger then scrapes the ice out in the form of soft chewable flakes. Of course, the specifics may differ from one ice maker to another. For instance, gourmet ice makers use a more involved process to ensure the ice is clear and hard. But this is howice cubes are made when you push a button on your ice machine.